North Texas Athletics announced that they are changing the Mean Green Club into the Mean Green Scholarship Fund in conjunction with 2018 Football Season Tickets going on sale. Also coming with the name change is a fairly dramatic change to how football and basketball priority seats are handled depending on your donorship level. 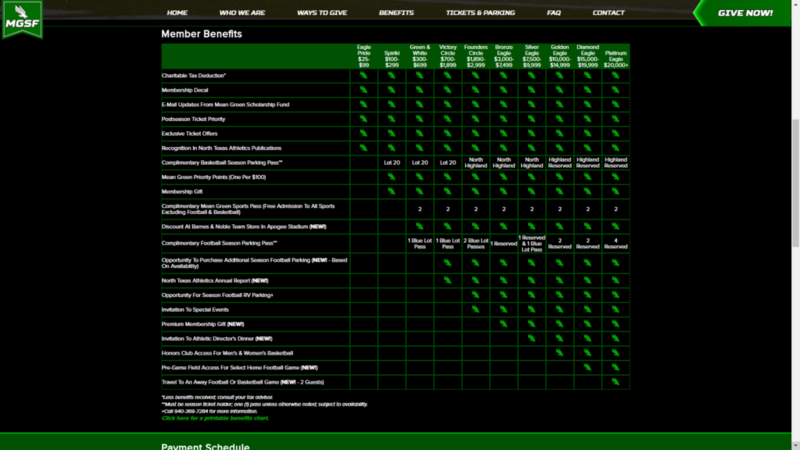 A new site was developed and does a good job of explaining the new benefits package. Here is the story from the Denton Record Chronicle. The article highlights that North Texas sits near the bottom of Conference USA when it comes to donor participation and total dollars contributed. North Texas Athletics has long relied on the student body to be a primary “contributor” in terms of fees paid be students and also funds provided by the university itself. It is good to see changes to the ticket and donor requirement levels in an effort to raise more money for the scholarship fund and overall revenue for the department. It shows that Mean Green Athletics is serious about competing for championships in Conference USA and at a national level. This is a risky change to be making though yet it will get North Texas more in alignment with how other universities handle their athletic donations and preferred seating ticket requirements. Under the old structure, there were nine different levels starting at $25 for the lowest level and $15,000 for the minimum requirement of the highest giving level. Under the new structure, there are 10 levels. Perhaps the most notable change is that the entry amount for each level has been steadily increased while you may not get as many benefits based on what you might have been donating previously. For instance, if you were previously giving $1,000 that would have put you at what is not the Victory Circle level (previously Bronze Eagle level). The benefit you may most likely miss will be the Highland Street parking for Men’s and Women’s basketball games if you are a basketball fan. Perhaps the biggest and most obvious change is rather than be allowed to purchase a certain number of depending on your donor level, there is now a minimum per seat donation required. For instance, in Apogee Stadium to sit in the Scholarship Premium sections (105, 206, & 207), the per seat donation requirement is now a minimum $200 per seat donation. Before, all that was necessary to sit in those sections was a minimum $500 MGC donation and you were allowed a certain number of tickets you could purchase. Whatever your highest per seat requirement is for whichever of the three sports — Football, Women’s Basketball, or Men’s Basketball — will also count for other sports as well. So if you need $400 for two seats in the Scholarship Premium area of Apogee yet need $300 for a floor seat for Men’s Basketball, you will already be covered. The per seat donation requirement is not cumulative between the three sports. I’m still trying to get clarification on how tailgating is going to work for football in 2018 however if you were a “regular” tailgater in the area where RVs were located like I was and you can’t get into the Founder’s Circle level, you won’t be able to tailgate in that area and you aren’t allowed to tailgate behind RVs in the huge grassy area between the parking lot and Highland Park Road. The group I am with will have to find a new spot to tailgate. I’ll have a new article posted once it is better known where tailgaters will be allowed along the green space surrounding the Blue Lot parking area. It will be expected that you will tailgate behind your vehicle. For those that use pop-up tents, which are a must in the earlier part of the season where it can be incredibly hot, tailgaters may end up taking up a significant amount of space in the drive area. This might cause problems for other drivers, especially once it starts getting close to game time. I will see about providing an area map of the parking lot with area people can possibly set up their tailgates without having the be in the middle of the parking lot. I am going to try to work with some folks in the athletic department so that it can be communicated where people can and should set up their tailgates in the future. It should be understood that the point of the blog entry is not to complain. However, as a passionate fan I feel that certain opportunities were missed and there are opportunities for challenges if things aren’t executed a certain way which could result in some donors with some hurt feelings outside of the already announced changes. This blogger is not thrilled with the new name of the organization. With the name changing to the Mean Green Scholarship Fund, it implies that all donations will go to just that – scholarships. I believe a much better name for the organization would have been something along the lines of the Mean Green Athletics Foundation. The goal of the organization would be to fundraise for student athlete scholarships and capital campaigns, with the primary focus being scholarships. It possible this name was avoided due to the fact there already exists a foundation at the university level for UNT – The University of North Texas Foundation. There may have been concerns that having an athletic foundation might cause some confusion between the two organizations. There also could have been tax implications between a Foundation versus a Fund in how the organization is structured when it comes to its tax exemption. Finally, if you are a basketball fan, demand for the Highland parking has exceeded capacity so you will have to give more to park closer to the SuperPit. Lot 20 consists of the east side of the Fouts parking lot and based on illustrations on the website, the entire parking lot will be reserved for MGSF donors, although that is still to be confirmed. The good thing is this year a NT Police officer has been helping direct traffic at Highland and North Texas Blvd so that pedestrians can safely cross the street, especially after games. I don’t recall seeing an officer before games but if the plan is to use Lot 20 even more for basketball gameday parking an officer will more than likely be necessary before games to assist in pedestrian safety.